Co-authored by two respected authorities on hedge funds and asset management, this implementation-oriented guide shows you how to employ a range of the most commonly used analysis tools and techniques both in industry and academia, for understanding, identifying and managing risk as well as for quantifying return factors across several key investment strategies. The book is also suitable for use as a core textbook for specialised graduate level courses in hedge funds and alternative investments. 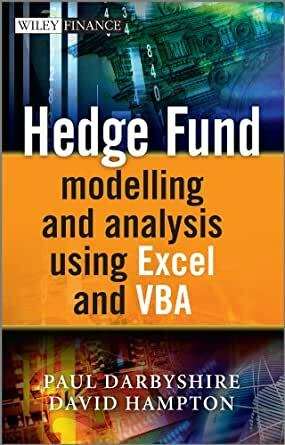 The book provides hands-on coverage of the visual and theoretical methods for measuring and modelling hedge fund performance with an emphasis on risk-adjusted performance metrics and techniques. A range of sophisticated risk analysis models and risk management strategies are also described in detail. Throughout, coverage is supplemented with helpful skill building exercises and worked examples in Excel and VBA. The book's dedicated website, www.darbyshirehampton.com provides Excel spreadsheets and VBA source code which can be freely downloaded and also features links to other relevant and useful resources. Most institutional investors have diversified allocations that span a variety of asset classes, but some level of implicit equity exposure lurks in virtually every asset. This book is an essential read for those who wish to understand the modern world of hedge fund investing. "Hedge fund modelling and analysis by Darbyshire and Hampton is a comprehensive and highly–readable guide to the world of hedge funds. The book covers not just the questions of fund structure and organisation, but also the important questions of performance measurement and analysis. It also covers the quantification of risk and provides the Excel/VBA tools needed to do this. It is the book to read if you want to run or analyse a hedge fund." This book provides a valuable new perspective on hedge funds. It treats them both as investment vehicles as well as an asset class. This dual viewpoint allows the reader to understand both the operational aspects of hedge funds as well as how to model the major hedge fund indices. The modeling framework is clearly outlined and shows the reader how to construct portfolios of these indices. It will be of interest to anyone investing or interested in investing in hedge funds. It has been quite some time since I spent so much money to get so little. In spite of the book's title, don't expect to find any hedge fund modelling or analysis. It is so simple - the first three chapters give some standard background on hedge funds, the remaining four chapters are a collection of standard textbook stuff on statistics applied to investments, risk adjustment, factor models and VaR. The only link to hedge funds here is that the numerical examples are based on some hedge fund data (which even turn out to be somewhat fictitious, but that's besides the point). I would guess it took at most a few days to put together this book. Bottomline - stay away, better run away from it. 5.0 out of 5 starsNice addition and compliment to one's hedge fund library! I would like to compliment the authors of this book! It is not "just another book on hedge funds" (just perform a search) with repetitive information. The book provides a wealth of information in the areas of sources of data of hedge fund information along with methods to analyze and optimize your portfolio as a hedge fund investor. You won't be disappointed in adding this book to your hedge fund library! Don't be decieved when you recieve it. Although it's 250 pages roughly it is packed with awesome insight on how the secretive hedge funds operate and in detail description. Definitely a great book and im definitely enjoying the read so far!